You can create two kinds of gists: public and secret. 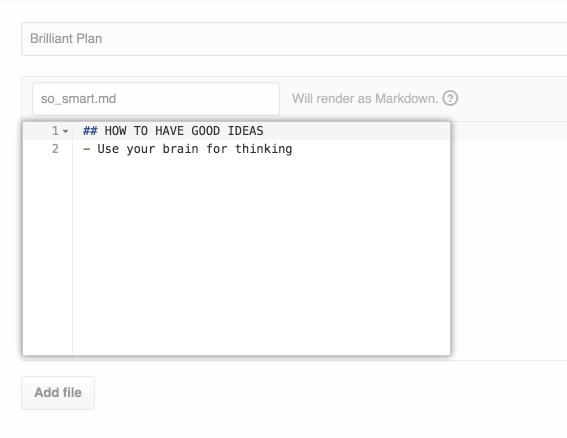 Create a public gist if you're ready to share your ideas with the world or a secret gist if you're not. If you are signed in to GitHub Enterprise when you create a gist, the gist will be associated with your account and you will see it in your list of gists when you navigate to your gist home page, http(s)://[hostname]/gist or http(s)://gist. [hostname] if subdomains are enabled . Warning: Anonymous gists cannot be deleted from the web browser. To have an anonymous gist deleted, contact your GitHub Enterprise site administrator. Please provide the URL of the gist you wish to delete. You can also drag and drop a text file from your desktop directly into the gist editor. Sign in to GitHub Enterprise. Navigate to your gist home page, http(s)://[hostname]/gist or http(s)://gist. [hostname] if subdomains are enabled . Type an optional description and name for your gist. Type the text of your gist into the gist text box. To create a public gist, click Create public gist. To create a secret gist, click Create secret Gist. Note: After creating a gist, you cannot convert it from public to secret.